You can access the full Wisconsin Employment Law Manual (over 50 state-specific reference resources) and Employee Handbook templates (over 10 state-specific handbook policy templates) below, as well as view key state and municipal deadlines, additional state-specific resources and links to key municipal coverage. XpertHR's Legal Timetable helps you keep track of key compliance dates in Wisconsin, as well as other states and municipalities. Updated to reflect 2018 Form W-2 filing deadline extension. Updated to clarify requirements related to the outside salespersons exemption. Does This Law Apply to My Organization in Wisconsin? Updated threshold, statement and guidance to reflect extended reinstatement rights. Updated to reflect an amendment to the permitted occupations for minors 13 years old and younger, effective March 30, 2018. Updated to reflect amendments to military leave law, effective April 18, 2018. Updated to reflect amendments to the military leave law, effective April 18, 2018. 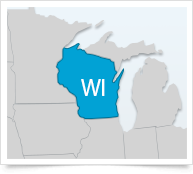 A round-up of the comprehensive state coverage XpertHR offers to help Wisconsin employers ensure they are compliant with state HR and employment laws.